Fruit is not only enjoyable to eat -- as it should be, considering the very word fruit stems from the Latin word frui, meaning "to enjoy, use" -- but it also nourishes and protects the body with powerful, built-in medicinal activity. Fruits are by design a "perfect food," intended to entice animals to consume them in order to help disseminate their seeds, for instance. This means that unlike grains, and other lectin- and anti-nutrient-rich organisms, e.g. 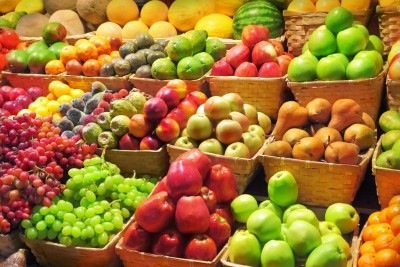 wheat, tomato, beans, we humans have chosen to make into our food, fruits are less likely to come equipped with "invisible thorns," as they benefit as much in being eaten as we do in eating them. Also, like our now hard-wired biological dependence on obtaining vitamin C from external sources (unlike most animals we can not produce it from glucose), countless millennia of fruit consumption has left our genetic infrastructure in need of continual resupply of many of the key vitamins and phytocompounds they contain copious quantities of. Listed below are links to blogs that reference this entry: The Evidence-Based Healing Properties of 13 Common Fruits. This page contains a single entry by Toni published on September 20, 2012 10:18 AM. Neurosurgeon Shows How Low Levels of Radiation Such As Wi-Fi, Smart Meters And Cell Phones Cause The Blood Brain Barrier To Leak was the previous entry in this blog. Genetic Roulette A film by Jeffrey M. Smith – Narrated by Lisa Oz is the next entry in this blog.